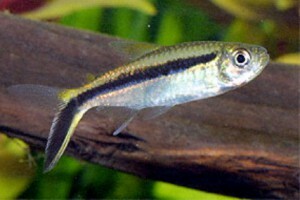 Very peaceful schooling fish that is suited for every community aquarium together with other peaceful fishes. They are very sensitive for water pollution, so it is very important to change the water regularly. (up to 30 % every 2 weeks). The aquarium should be planted very well on the sides and background.The fish is omnivorous. You should give them a great variety of live, frozen and dry food. Breeding is easy. When the water is soft and acid up to 1000 eggs are laid and fertilized between fine leaved plants. After spawning the parents should be removed. A large part of the water should be changed because the male has released a lot of sperm. After 1 day the eggs hatch. When the young fishes are swimming free you can raise them with very fine infusoria.